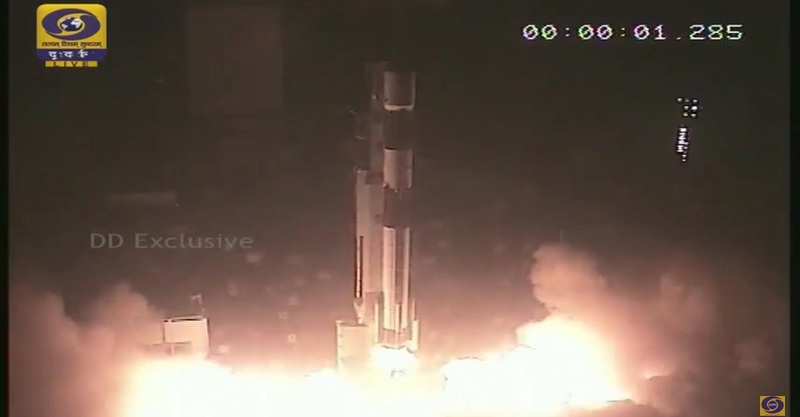 The Indian Space Research Organisation (ISRO) has successfully launched its flagship PSLV booster, putting six satellites for Singapore into orbit. The liftoff occurred at 7:30 a.m. EST (12:30 GMT) on Wednesday, Dec. 16, from the Satish Dhawan Space Centre (SDSC) in Sriharikota. The mission, designated PSLV-C29, was carried out flawlessly and the satellites reached their targeted orbit. ISRO started countdown operations for the mission on Monday, Dec. 14. The launch vehicle was filled with propellant few hours after the countdown commenced and a series of last checks was performed to ready the booster for the ignition. The PSLV rocket was used in its CA (core alone) configuration, what means it blasted off without the use of solid strap-on motors. The vehicle used a “typical” PSLV flight profile to fulfill its mission, climbing vertically for just a few seconds and then rolling in a south-east direction. "There was rainfall over the region ... despite the weather conditions, the team has been able to pull off a perfect launch," said SDSC director P. Kunhikrishnan. The rocket’s first stage separated about one minute and 51 seconds after liftoff. One minute later, the heat shield was detached from the launch vehicle exposing its payload. The second stage was ignited to continue the flight until separation at four minutes and 20 seconds after the rocket has left the pad. The third stage flew for five minutes and 23 seconds, delivering the payload into a suborbital trajectory and separated at T+9 minutes and 44 seconds. The fleet of satellites was deployed 18-22 minutes into the flight. They were injected into a circular low-Earth orbit (LEO) at an altitude of 341 miles (550 km), inclined some 15 degrees to the equator. The mission ended in testing restart and cutoff of the fourth stage, at approximately 67 and a half minutes after launch. The tests were successfully conducted by ISRO for the first time. This technique will allow the country to launch several satellites at different orbits. ISRO is expected to use this capability in next year’s orbital missions. "The restart and shut off of the fourth stage engine is done as a first step towards launching multiple satellites but in different orbits," a senior ISRO official told IANS. At the time of restart the fourth stage was at an altitude of 325.53 miles (523.9 km). The engine was operated for four seconds and went up to an altitude of 325.6 miles (524 km) before the stage was cut-off again. The mission’s main passenger is the TeLEOS-1 satellite. Other payloads include smaller spacecraft – two micro-satellites (VELOX-CI, Kent Ridge-1) and three nanosatellites (VELOX-II, Athenoxat-1, Galassia). TeLEOS-1, built by ST Electronics, is Singapore’s first commercial Earth observation satellite. Weighing 882 lbs. (400 kg), it has dimensions 6.23 by 6.56 by 5.25 feet (1.9 by 2 by 1.6 m). It features an electro-optical camera and four deployable fixed solar arrays. The satellite will be operated by AgileSpace company. It is expected to be operational for five years. TeLEOS-1 will deliver high-resolution imagery – 3.28 feet (1 m) panchromatic – for precise and high temporal change detection, mapping, and in-depth image analysis. The images will be collected with an average revisit time of 12 to 16 hours. AgileSpace states that it will enable decision makers and users convenient access to high temporal imagery and geospatial solutions to respond to time-sensitive events, such as homeland security and border control, maritime situation awareness, and disaster monitoring and management around the equatorial belt. VELOX-CI, built by Nanyang Technological University (NTU) in Singapore, is a 271 lbs. (123 kg) experimental microsatellite mission to study tropical climates. It will be operated by NTU, using a special technique known as radio occultation and advanced algorithms, to obtain weather data such as the upper atmospheric temperature, humidity, and pressure, which are useful for long-term climate studies. VELOX-CI features two deployable solar arrays and its payload consists of a GPS occultation experiment, experimental RF probe, and other experimental missions such as altitude determination with GPS. The VELOX-II is a 28.6 lbs. (13 kg) six-unit CubeSat. It is a part of NTU’s Undergraduate Satellite Program, which provides an opportunity for engineering students to participate in a multidisciplinary hands-on space project. It features two deployable fixed solar arrays and will be carrying experimental satellite-based communication hardware. "If we have our own Singapore-made satellites, we can customize the technology, the sensors and instruments to meet our own needs. For instance, we can monitor haze. We can get the information anywhere, any time," said Low Kay Soon, Director of the Satellite Research Centre at NTU. Kent Ridge-1 is a hyperspectral imaging microsatellite developed by the National University of Singapore (NUS) together with Berlin Space Technologies (BST), designed for Earth observation purposes. It weighs 172 lbs. (78 kg) and is based on BST’s LEOS-50 platform. It will be operated by NUS for five years. The Kent Ridge-1 spacecraft carries three payloads: two medium resolution hyperspectral imaging payloads based on the Fourier transform recovery (FTR) method (PPL1 and PPL2) developed by NUS, and one high-resolution video payload (SPL) developed at BST. These instruments will enable multitudes of new applications in the monitoring of land, water, and vegetation and will be useful to contribute towards the effort to prevent and manage such disasters in this region. The Galassia two-unit CubeSat, developed by NUS, is designed for atmospheric research. It carries two payloads: one measures the total electron count in the Ionosphere, and the other, named Small Photon-Entangling Quantum System (SPEQS), will generate and detect photon pairs. The satellite weighs 7.5 lbs. (3.4 kg) and features solar cells. Athenoxat-1 is a three-unit Earth-observing CubeSat developed by Microspace Rapid Pte Ltd. of Singapore to demonstrate the functionality of a night vision optical payload on a CubeSat-Class Nanosatellite. It features four deployable fixed solar arrays and solar cells. "The satellites will be able to produce information at a much higher frequency. This will surely be very important when you use it for disaster monitoring in the region like Southeast Asia," said Goh Cher Hiang, Project Director of the Satellite Program at NUS. The four-stage PSLV booster is India’s most reliable launch vehicle. It has been in service for more than twenty years and has been used to launch various satellites for some of the country’s most historic missions, such as the Chandrayaan-1, Mars Orbiter Mission (MOM), Space Capsule Recovery Experiment, and Indian Regional Navigation Satellite System (IRNSS). The rocket has delivered more than 40 satellites to space for 19 countries. PSLV is capable of lofting up to 3.25 metric tons to LEO and about 1.42 metric tons to geosynchronous transfer orbit (GTO). The rocket uses an Earth-storable liquid rocket engine for its second stage, known as the Vikas engine, developed by the Liquid Propulsion Systems Centre. The third stage of the PSLV is a solid rocket motor that provides the upper stage’s high thrust after the atmospheric phase of the mission. The fourth stage is composed of two Earth-storable liquid fueled engines. 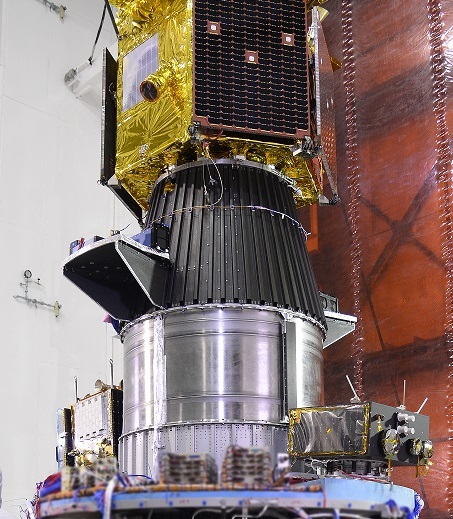 The 144 ft. (44 meters) tall CA version of the PSLV, which was used in Wednesday’s launch, is the upgraded version of the rocket in its standard configuration. The vehicle, with a mass of 230 metric tons at liftoff, does not include the six strap-on boosters used by the PSLV standard variant. Wednesday’s mission was India’s fifth orbital liftoff this year and the 32nd PSLV launch overall. The country’s next launch is scheduled for January 2016 when a PSLV-XL rocket will send the IRNSS-1E navigation satellite into space. Two further IRNSS launches are scheduled for early next year.